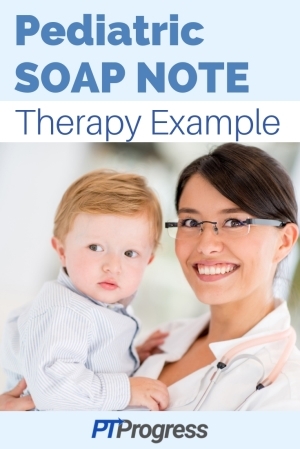 This pediatric SOAP note example is based on an actual pediatric Physical Therapy evaluation. Details have been edited to keep the identity of the patient confidential. This sample evaluation SOAP note may be useful for physical therapists, occupational therapists, or students who wish to see an example of a thorough pediatric evaluation in a rehabilitation setting. Explore our other articles for more documentation examples. Patient is a 3 year, 1 month, and 10 day old male seen for outpatient PT services at Children’s Hospital on the 1oth floor Neuro Rehab gym. Patient’s medical diagnosis is non-polio myelitis resulting as a complication of enterovirus 68 and the chief complaint is bilateral LE weakness. Patient has no reported history of pain. Referral for outpatient PT occurred after patient was discharged from the inpatient rehab unit of Children’s Hospital. Patient transitioned from OT to PT on this date and no parent or guardian was present to provide consent; however, patient was content and willing to participate in treatment on this date. Patient demeanor indicates the patient has consented to be examined and evaluated. Limited information regarding patient’s home environment was available as no parent or guardian was present for evaluation. Patient’s primary PT reported patient is an only child that lives at home with his mother in Detroit and does not attend school or daycare. Patient primarily moves through the community in a wheelchair but has other equipment as indicated below. Past Medical History: SPT’s were unable to elicit information regarding family medical history or patient birth history but primary PT states patient had parent-reported normal development without concerns prior to development of enterovirus 68. Patient has asthma and progressive weakness. Appearance: Pt. presented in long sitting on floor mat before therapists entered room. Equipment brought by patient included RGO (reciprocal gait orthosis) with oversized shoes to accommodate ankle/foot attachments, a Nimbo walker, and custom wheelchair. No lines/tubes or skin irregularities noted. Mental Status: Patient was alert and responsive to SPT questions throughout treatment session and demonstrated normal memory, attention, judgment/safety, and command following for age. Specific MMT testing was not performed secondary to patient age and cognitive ability. Patient was hypotonic and demonstrated flaccidity throughout lower extremities and demonstrated hypermobility of the hips and knees. Pt also presented with bilateral PF contractures limiting DF. Patient had normal muscle tone throughout the trunk and upper extremities. Pt able to sit with eyes closed, hands in lap and LE support for 10s. Pt is able to move UE without displacing trunk and without loss of balance with eyes open. Pt is able to displace trunk during reaching and return to starting position without loss of balance. Pt’s balance is slightly impaired with no LE support. Not able to directly test fractionated movement of the upper extremities as patient refused; however, observing functional tasks throughout treatment session indicated fractionated movement of the UE’s. Patient was unable to participate in fractionated movement testing of the LE’s as severely decreased strength limited his ability to perform AROM motion. Stretching: Bilateral gastrocnemius and soleus muscles. Ambulation x75 feet using RGO and Nimbo walker. Crawling ‘army crawl’ with UE on soft mat. The patient presents with a diagnosis of bilateral LE weakness secondary to medical diagnosis of non-polio myelitis. The prognosis of impairment recovery for the lower extremities is poor. Lower extremity motor function is absent at level L2-S2 and sensory perception is absent from L4-S2. In terms of PT prognosis, the patient is rated as fair. Patient’s age and upper extremity strength is an overall positive modifier for improving functional outcome. However, at this time his age leaves him impulsive and unable to understand safety precautions regarding his mobility. Also, the primary PT expressed concern about family adherence to the current HEP, and decreased attendance at PT appointments has been noted. Both of these contribute to negative moderators for this patient. Patient will increase muscle length of gastrocnemius and soleus within 2 weeks as measured by R2 value during passive stretch. Patient will increase ankle range of motion from -10 degrees to 0 degrees after 10 minutes of stretching in 2 weeks. Patient will demonstrate reciprocal gait when ambulating with RGOs and Nimbo walker. Patient’s mother will demonstrate HEP including how to stretch bilateral gastrocnemius and soleus daily for 10 minutes. Patient will ambulate 100 feet using RGO and Nimbo walker using a reciprocal pattern throughout. Patient will be transfer to and from bed independently using AAD. Patient will be able to ambulate throughout community with RGOs and reverse walker. Patient will transfer independently and safely from patients wheel chair to/from floor. Patient will be able to do frequent skin checks and stretching independently or with help from parent to maintain skin integrity and prevent musculoskeletal complications. Patient and caregiver will be educated on general safety during transfers and ambulation. Patient will progress towards normal developmental milestones as health condition allows. Pt. recommended to continue being seen 2x/week for 60 minutes and to be encouraged to attend those scheduled visits. Patient also should be fitted for AFO’s to be worn while in wheelchair/on floor and night splints to be worn at bedtime to further reduce plantarflexion contracture when not in RGO’s. Reassessment to be completed in 10 visits or if notable physical/mental status change occurs. Pt. parents unable to attend and consent to evaluation and treatment. Current plan is to continue as previously indicated until parents can be available to confirm further intervention.